Maud Powell's numerous articles and interviews still provide solid advice and important insights to musicians and music lovers, young and old. Unfortunately there is no pursuit in which so much ignorance and vagueness prevail, considering the essentials and probabili­ties of success, as in music. The most common mistake is that the life of a professional musician is easy and enjoyable. Enjoyable it is for those who love their art for its own sake, but easy--never. I work harder today than I did when I was a student in the Leipzig Conservatory. That is the common ex­perience of all artists. That we are greatly in need of enlightenment on every phase of the musical problem is evident. But my task is to cover the violin field and I will hark back to the question--Is it possible to make a good living with the violin? My answer is an affirma­tive, with one qualification, namely, that one's ambitions are made to square with one's talents and one's circumstances. With this reservation I maintain that the good violinist can always make a good income, and I will add that the avenues of income are widening continually in this country. You will have need of all these along the road to fame, and when you come to the end of the journey the reward is by no means in sight. You are in the position of a man who has toiled and slaved, stripped himself, his family, his friends--for what? A ticket in a lottery. After you have spent your youth in the sweatshop of art, you are quite likely to be snubbed by the public. Your technique may be flawless, your artistic develop­ment wonder­ful, but if you lack that indefinable personal quality--magnetism--the great public, which is moved most by human qualities, will give you the cold shoulder. And magnetism is something money cannot buy nor any teacher impart. To begin with, how do you know your talent is equal to your ambition? Because you play better than any one in your town ever played at your age is no reason that you would compare remotely with very real and vital talents--talents that have brought their fortunate possessors farther along at twelve than you may get at twenty. Do you know that Kreisler could play the big concertos at twelve? Elman, Kubelik and Von Vecsey were full-fledged virtuosi on the mechanical plane at an age when the average American child begins to think of taking up the violin. Granting that the money is available, the point of contact between the young artist and the public is one that requires delicate handling. Many who have an adequate technical and artistic equipment fail through a mistaken conception of the concert artist's function. The general public goes to concerts in search of entertainment and not education. We may safely place the average income of a good orchestral player at two thousand dollars a year. It isn't a large amount according to some standards, but it will compare favorable with the average professional income. And the good orchestral player is an artist. In the estimation of thinking musicians, he ranks far higher than the mediocre virtuoso, while he performs a far greater service for his art. And oboe players' services are always at a premium. Trumpet players, trombonists, horn players and clarinetists are always in far greater demand than players of stringed instruments. Good performers on these instruments draw salaries running from thirty-five to seventy-five dollars a week and they can always find employment all through the year. But what chance, you may ask, have women in the orchestral field? Just as much chance as they choose to make for them­selves. The girl with the fiddle-box no longer excites comment. Woman's place in the violin field is firmly established. Over a decade ago, Nora Clench sat at the first violin desk in the Buffalo Symphony Orchestra. The Women's Symphony Orchestra of Los Angeles has been in ambitious and honorable existence for sixteen years. 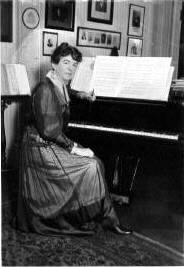 Several women play in the Hartford Symphony Orchestra, and we have the well-known Fadette Women's Orchestra of Boston and the Aeolian Ladies' Orchestra in London. If we have no women violinists in the New York orchestra, we have had women harp players in the New York Symphony, the Russian Symphony and the Metropolitan Opera House. The field is open to them and I see no reason why they should not be regularly employed, if they wish to be. They have the qualities that are necessary for the work. American women, especially, have a good sense of rhythm. They are imitative, adaptable and conscientious, with endless patience for detail. They are quick to seize the trend of another's thought and have marvelous powers of carrying out other people's ideas. It can also be urged that we are not so thirsty as the men!